Annie comes into possession of Shung’s power crystal. This episode is a bit reminiscent of the LOTL70 episode "The Possession" in which Cha-ka obtains a wand from one of the pylons and then gives it to Holly who becomes possessed by it and even uses it against her own family. In our LOTL90 episode, Stink first obtains Shung's crystal dagger then gives it to Annie who becomes entranced by its evil power and uses it against her family. The Sleestak appear to be omnivorous. Nim is seen eating a melon from a tree, while previous episodes suggest they hunger for meat. Shung again demonstrates some telepathic ability when he senses that someone has his crystal dagger. Is Shung's ability natural or a by-product of his association with the crystal? After Annie drops a spoiled melon on his head, Kevin leaves her stranded up in the tree in which she is picking the fruit, knocking down the ladder so she can't get out. Given that she's on a limb at about bite-height for Scarface, isn't that potentially a pretty reckless revenge to take on her? While complaining to herself about her predicament in the tree, Annie refers to her brother as "wart breath." Did she pick this up from their encounter with Shung in the previous episode ("Shung the Terrible")? It sounds like the kind of insult he uses with his lackeys. During the stop-motion animated sequence of Big Guy helping Annie out of the tree, you can see that the color and pattern of Annie's shirt changes between the live actor and the stop-motion model of actress Jennifer Drugan. The flower pattern on her shirt disappears. At 8:57 in the episode, there is a great shot of Scarface lunging to make a meal of Annie before she forces him away with the power of the crystal. We see that the Porters are on campout, exploring the Land. They have tents set up on the ground in the middle of the jungle. Is that a wise way to sleep at night with the kinds of humongous creatures that live there? In the scene from 16:05-16:08, as Annie is backing away from her father, into the jungle, it looks like the scene was shot with her walking forward and the film then run in reverse during editing to give the appearance of her walking backward. I don't know why they would have shot it that way unless they felt it gives the scene an eerie, more ominous feel to accentuate the evil influence of the crystal on her. 5:51 Stink says, "Shooka-shooka." "Gift." 5:59 Stink says, "Kiba." "Sky." 7:38 Stink says, "Annie, sa?" "Annie, what?" 8:24 Stink says, "Yo, Annie Porter." "Yes, Annie Porter." 8:44 Stink says, "Mewki! Mewki!" "Tyrannosaur! 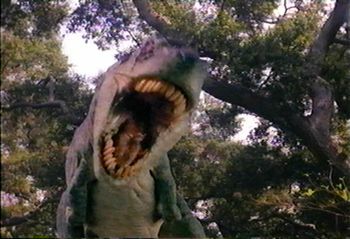 Tyrannosaur!" 9:28 Stink says, "Malu! Malu!" "Bad! Bad!" 16:27 Stink runs through the scene yelling "Annie" and "malu." "Malu" means bad or evil, so Stink is indicating the evil influence of the crystal on Annie. 17:31 Stink says, "Ayu. Ayu." "Help. Help." Is the crystal dagger inherently evil? Or has it just been poisoned by Shung's own maleficence?